Calling all OBX motorcyclists: The Annual Outer Banks Bike Week will return for its 17th year this spring! This event, a favorite among bike enthusiasts and die-hard riders, will take place April 20, 2019 – April 28, 2019. Join other motorcycle aficionados from all over the East Coast as you ride into the Outer Banks for a week-long celebration with live music, entertainment, contests, bike shows, guided tours and other fun events. Over 100 vendors will be on site throughout the week and there will be plenty of delicious, local food. Most events take place at the Harley Davidson in Harbinger. Some events take place at the Nags Head location and some local restaurants will host related entertainment events. And let’s face it – whether you’ve just gotten into the sport or you’ve been riding your whole life, there’s no better place to ride the wind and feel the fresh air on your face than at the beach. Nags Head is a great place to stay if you plan on attending Bike Week. Not only will you be close to all of the action but there are dozens of great local attractions to check out when you aren’t at a Bike Week event like the Nags Head Golf Links golf course, Bodie Island Lighthouse, Kitty Hawk Water Sports, and First Flight Adventure Park. Plus, you’ll be minutes away heading over the new Bonner Bridge for a relaxing ride down Highway 12 South. Whether you plan to stay the entire week or only for a few days, Seaside Vacations has the perfect lodging option for you. 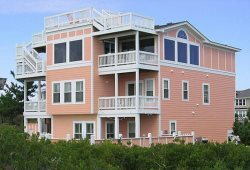 Choose from a selection of Nags Head Vacation Homes including oceanfront condos, luxurious cottages and poolside houses. Location: Outer Banks Harley Davidson (8739 Caratoke Hwy. Harbinger, NC 27941). Schedule of Events: Entertainment, live music, bike shows, guided tours, 100+ vendors, outdoor concerts, contests, and more. Schedule still TBD. For more information, visit https://www.outerbankshd.com/know-one-of-the-best-spring-riding-rallies-on-east-coast--bike-week.